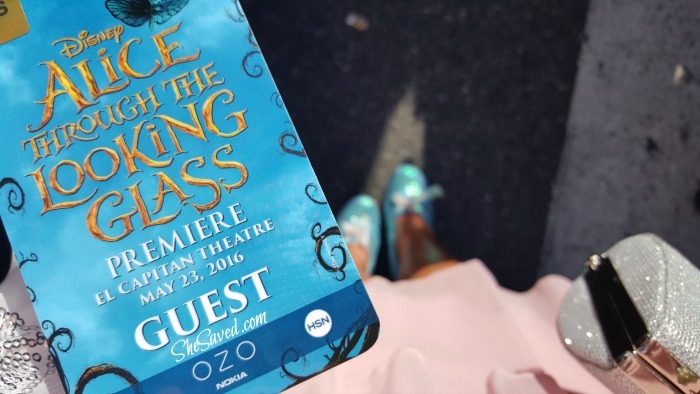 Last week I spent time in LA covering the premiere of Disney’s Alice Through the Looking Glass and earlier in the week I shared with you my time on the Red Carpet Premiere of Disney’s Alice Through the Looking Glass along with my interview with the darling Mia Wasikowska who plays Alice. 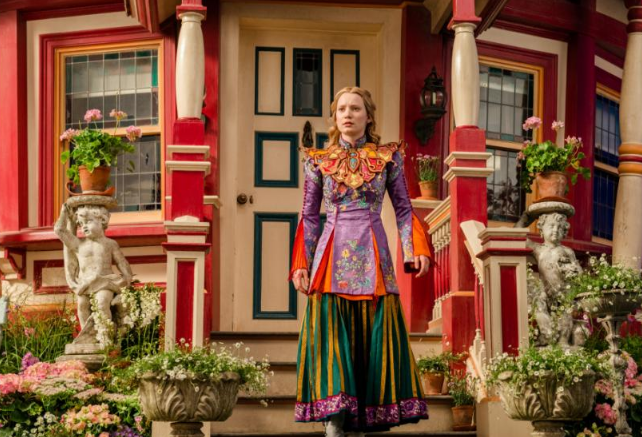 I also recently shared my review of Disney’s Alice Through the Looking Glass. 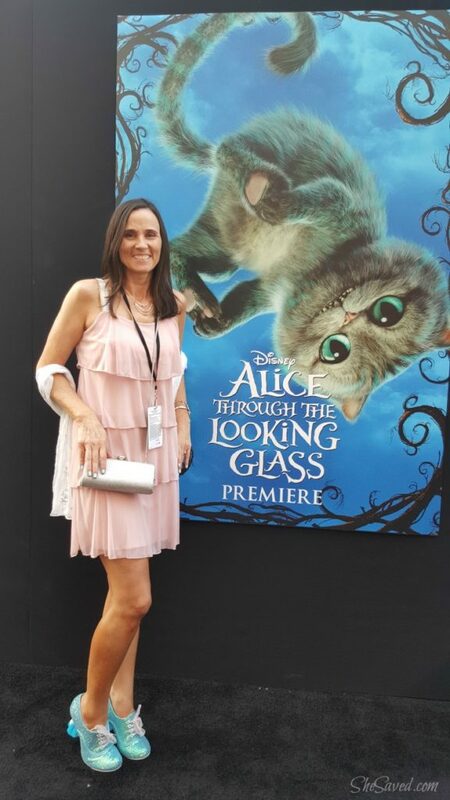 My trip to LA was a whirlwind of awesome but the absolute highlight was meeting Suzanne Todd, the producer of Alice Through the Looking Glass. I think you will enjoy reading my Suzanne Todd interview as I certainly enjoyed writing it and the experience of meeting her in person. Suzanne is a highly accomplished film and television producer, a single mother of three and don’t let her gorgeous looks fool you, she’s also brilliant. Her smarts earned her a seat at the 2012 World Series of Poker main event in Las Vegas (wait, what!!?) and while a student at USC, Suzanne was an undefeated champion for a week on The $100,000 Pyramid. This woman takes life by the horns, and wins! On top of all of that, she’s real. Super real. Read on. From the moment that she walked into our interview, Suzanne was friendly and warm and she greeting the room as if she was meeting up with friends. So refreshing. I am not wearing them tonight, and I’ll tell you why. I spent 30 years making movies but I’m sort of new to all of this twitter and tweeting. My really good friend Maria Shriver turns 60 this year, and of course instead of asking for a birthday present, she said, “Please just help me with my charity thing that’s coming up instead of buying me a birthday present.” So, I said I would help her with her fundraiser, which is called Move for Minds. It was an event for raising money for Alzheimer’s. She lost a parent to Alzheimer’s. So I had posted for people to support the fundraiser and I thought maybe someone will donate. And all of my friends did, which was so nice. And there was one person that donated who I’ve never met, which I thought was so amazing, She wrote that it was in honor of her grandma, which was so touching, but I think she’s here? So at this point, my wheels are spinning a bit because I was very aware of her tweets about this fundraiser. While doing my research prior to my trip to LA for interviews, I saw her tweet out about this and I followed the link through to read more about it. The more that I read, the more that it touched my heart. I have seen first hand the cruel side effects of Alzheimer’s and it’s one of those charities that is always on my radar. Always. If you have ever watched loved ones suffer through this disease, then you know what I mean. 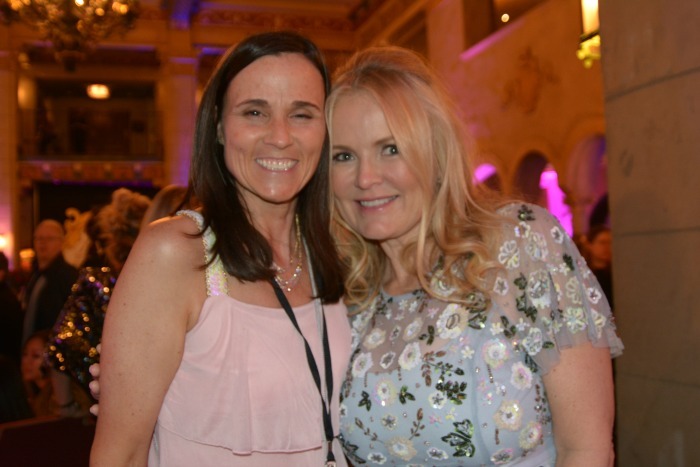 I so hope that they find a cure for Alzheimer’s and I hope that passionate and powerful people like Maria Shriver and Suzanne Todd continue to use their social influence for great causes like this. I’m giving you my special shoes. Thank you. I was really, really touched that you donated in honor of your grandma. We did the event on Saturday. We raised tons of money for Alzheimer’s research, and I learned so much about it actually. It was a great event. So thank you so much. So at this point, I’m just speechless and the other bloggers, my friends, are just so excited for me and I’m literally fumbling to say thank you. SUCH a random and unexpected moment, but truly, one of the neatest moments ever. Just so amazing to me that someone like Suzanne would even take the time to notice that I had made a small donation but then again – after meeting her, not surprising at all. Suzanne is checked in. She is present. She has a respect and love for others that is really apparent in her actions. Later in the night I was able to witness her interacting with her children, her friends and movie cast members and I have to say… this woman is even across the board. In a room full of celebrities and excitement over the premiere of her film, she seemed so unaffected. Taking time with her kids, interacting with our group of bloggers, hanging out just like a regular party attendee and yet, she was the producer of this celebrated film! I think that this character trait isn’t accidental. I think it’s intentional. As you will see in the interview below, she is a very intentional woman who makes choices and decisions about her life and the people that she shares it with by being intentional. I love that and it’s something that I hope to accomplish more in my own life, and hopefully teach my children the importance of being intentional as well. So. There you go. 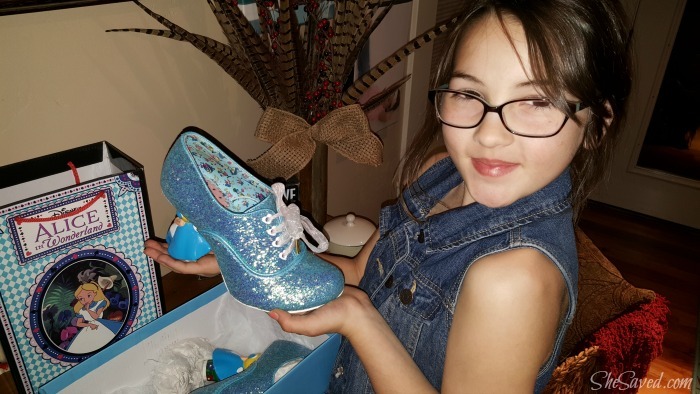 There is the story of how I came to own this pair of blue sparkly Alice shoes that I will cherish forever. And, the best part? THEY FIT!! I felt like Cinderella. The shoes were a perfect fit!! I actually wore them to the red carpet premiere of the movie because… how could I not!? And as cheesy as it sounds, such an honor to walk in this woman’s shoes. She is a woman after the hearts of other women. And I think we will all agree, we need more women like this. Talking with Suzanne was like having coffee with a girlfriend and I think that the other women would agree, she was just so down to earth, engaged and interested. I think you enjoy reading what she had to say. There are a lot of great themes in this movie. 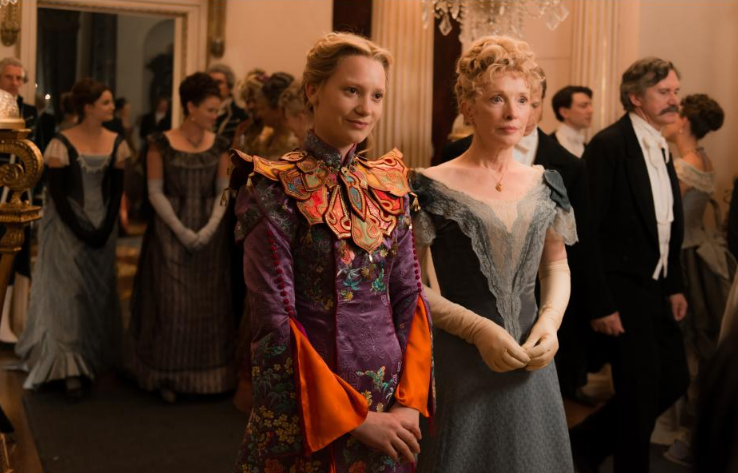 Family and Time and Alice being such a great heroine. Which are you most passionate about? My friend, the writer, Linda Woolverton, had come to me with 10 years ago with that idea of making a movie where the girl could be the hero. Having her be the heroine was so exciting to me. So it was very, very difficult to craft the sequel. We had never intended to make a sequel. We didn’t rush to make a sequel like to just cash in on the financial success of the first one. We wanted to be really thoughtful about it. So I think that was always at the core of it, trying to be true to Alice’s story. 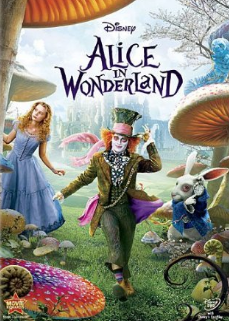 Trying to be true to the Lewis Carroll Alice and then in addition, really focusing on time. Because I am a mother. I have three kids. You guys here are all working triple duty as all moms do, and I just feel like the older I get, the more precious I find my time is to me. So that for us was really important. So really, those two things. The idea of being able to put a movie out there that is a kind of we girls can do anything movie. For my little girl who is 11 now, and also just recognizing that time is so precious to all of us. When I look at technology, you know, the lovely positive power of the internet. But the thing about technology is that it was supposed to be created to give all of us more leisure time. Remember the fax machine or the Blackberry? Now you’re gonna leave work early and have extra time to spend with your kids? But really what it has done in some ways is that it has turned all of us into 24 hour workers. There’s no time of the day when you can’t be doing something productive that has to do with your technology. So, it’s a balance that we all have to try and find for when we’re gonna turn it off of put it away and really sit down on the blanket and have a picnic with our kids because it doesn’t happen enough, but when it does, I think everybody has that moment where they think this is what I should be doing on a Sunday afternoon. I’m hoping people will watch the movie and really come out of it and have those conversations or just be in that space a little bit more because the movie inspired them to. That would make me really happy. As a single mom, how are you making all this work? Two of my kids are teenagers now, so that’s a big shift. I’ve been divorced like 6 or 7 years now. I have my kids 100 percent, so I have found over the years that it’s important to have time for the three of them together with me, you know family time, but also to have individual time with them. I didn’t realize that in the beginning, how important it was to carve out time for each of them, because they’re all different and unique in their one way. My schedule is always crazy. I use Google calendar. Probably everybody does, you know. Everybody has a color and I always joke and say it’s like a war operation of moving people around. You make your plan, and on the day somebody gets sick or they forget their homework, it’s the same for everybody. It’s just a little bit of craziness. And I want to point out here that I was actually able to meet Suzanne’s kids at the after party later that night and they really are the nicest kids! Very personable and friendly and you could tell that they really enjoyed hanging out with their mom. #winning! Probably one of the things that stood out to me the most about Suzanne was how real she was. We are similar in age, and it seemed to me that her parenting struggles are the same. Her concerns for her children are the same. She was very open about juggling parenting and work and as someone who was raised in a single parent home, I give extra kudos to her for doing it all as a single mom. Was Through the Looking Glass easier or tougher than the first one? In a way, I think maybe harder because the response to the first film was so kind of unexpected and overwhelming. So then there’s all this pressure. You want to do something with movies that will be commercially viable, because that’s why you get to make more movies, but you also want to do something that says something that’s important to you. Like I said, for me with the three kids, the older I get, the less I want to ever do a movie that doesn’t feed my soul. You know, you don’t want to do those movies that you’re just kind of doing because you need to, if you don’t have to. So, we built big sets on the second one, and getting the cast together was much harder on the second one because they’ve all continued to have like flourishing, amazing careers. They’ve done so many amazing things and Johnny’s always booked. He’s always working. On the first movie, the really interesting thing about the casting process was that normally when you’re casting a movie, you go through the script and you make lists of the characters, and then there’s about 20 actors on a list, and you go one by one and you offer it to them. You go to Brad Pitt and say Brad Pitt, do you want to do it? And he says no, and so then you go to George Clooney and say do you want to do it? And you kind of work your way through the process. On the first Alice, Tim literally just picked the people he wanted, and called them. And every single person said yes. There was one character where he picked somebody and she said yes, and then she had dates issues and so then we had moved on to somebody else, but everybody wanted to do it because they just wanted to obviously like work with Tim and they loved the script. So the second time, obviously, we knew who most of the actors were going to be, but scheduling was very difficult. It probably took us almost another year to really get started, to get all the actors when they could work at the same time. And even then, you know, you talk about the scheduling with the three kids, imagine with the actors! It wasn’t like we have all the actors for the three months we need them, you know? We have Johnny for these days here and we have Anthony’s days here. We have Sasha for these days, when he’s finishing the other movie. And it’s all like a very complicated jigsaw puzzle. You mentioned that you had never thought about the sequel when you were making the first movie. When was that day or that moment when you decide to do the sequel? We all took a moment to kind of breath and relax after finishing the difficult movie the first time. And then we just went back into the literature, you know, and read the books and re-read the books again and re-read the poems. And we actually read a couple other books on feminism and raising girls and the specific art of the emotional life of girls. And then it kind of started to gel for Linda. She had ideas and they all came together into this idea. She wanted to go back and see the characters when they were younger and what that trajectory was for Alice. To look at these different themes we talked about before, then it became clear that it was something we really wanted to do. Do you have a special message for single moms who are in pursuit of a career? You know, I’m learning every day just like the rest of you. I think however many years it is down the road for me now, I definitely, and I know it sounds like a cliché saying, but I definitely sweat the small stuff less and I feel like in my old life, I definitely sweated it more. And maybe that’s just because I don’t have time for it, or the energy for it, but, you know, situations, people, you know, things that bring drama and conflict and aren’t productive moving forward things, I really stay away from or avoid or I will cross the street to get away from. And that’s very different for me, I think, than it was probably 10 years ago or 15 years ago, you know. I’m very, very focused on what I think will be a positive outcome, and it’s something I actually talk about a lot with my kids and stuff that comes up for them, because I always think the best advice I can ever give myself is the advice I tell my kids, because I’m much better at telling my kids what to do than I am at telling myself. So if I pause and think about what I would tell them, then I usually do a better job. That idea of trying to avoid the stuff that actually isn’t helping you get where you need to go, including sometimes your own thought process about it, like having like negative thoughts inside or, telling yourself that something is harder than it really is, because it’s not really helping you. So you can just kind of let that stuff go. My kids and I say we just kind of like floated away, you know, because I’m also, I’m a big meditator. I have been for 20 years and I have taught it to my kids now. And when people always ask me how I get so much done in a busy day, I think that’s a big part of it, which makes no sense to people, because they’re like what do you mean? You take 20 minutes off twice a day to meditate? But for me it really helps me focus and stay on track and gives me a lot of good things that help me get other things done. I would say focusing on what you really need and just being brutal about it, you know? Also a little bit of learning to say no. 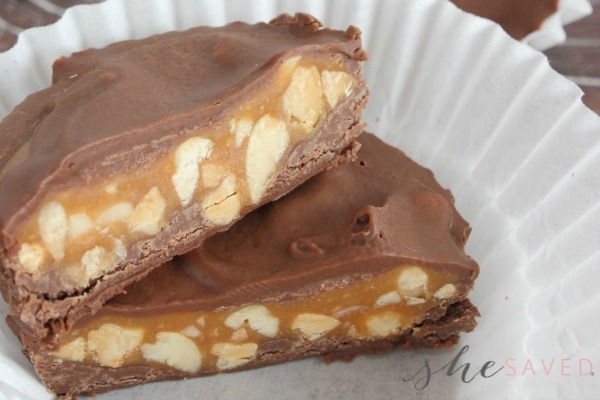 I’m definitely a little bit less of a yes to everything and people pleaser than I was probably when my kids were younger. And, you know, I think it’s a good thing. When you see it, you’ll see that, of course, there are no similarities in the R-rated movie and the Disney movie. The similarity that you will see is is that there is a relatability to the actual experiences. 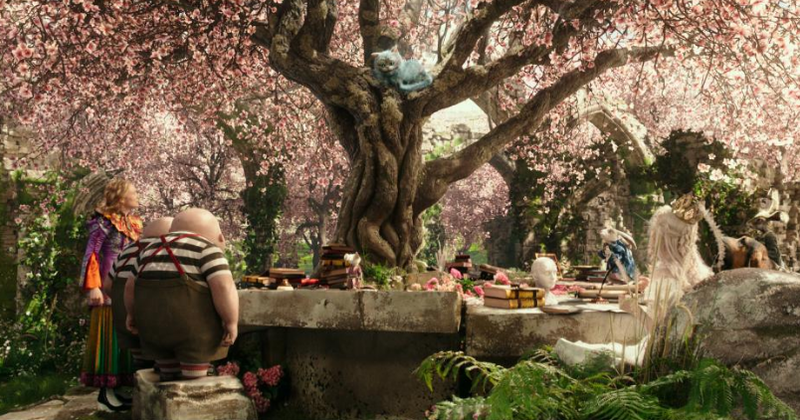 In Alice, we’re looking at a girl in her 20’s, and so that’s been a long time ago for me, but I remember that idea of trying to kind of balance career and balance a relationship. You’re kind of redefining what’s going on with your parents and all of that that we struggle with in our 20’s. In Bad Moms, obviously, those girls are a little bit older, but again it’s a relatable look at what it’s really like, how hard it is. And the thing that is so satisfying to me whenever I talk about Bad Moms is that I feel like we’re all so hard on ourselves, myself included, We’re all so hard on ourselves on a daily basis as moms, because we feel like we could have done more. We could have done better or that girl packed a better lunch or her kids speak Mandarin or, you know, all those things. And then usually, there’s somebody that is putting energy into making you feel bad. And that idea that hopefully you’ll come out of the movie and feel like you don’t really need to feel bad. Because what she says doesn’t really mean anything to you, any more than the guy standing next to you at Starbucks. You can just feel good about what your trying to do and enjoy your life with your kids rather than just trying to be this unobtainable, perfect mom. So, I don’t know, I guess maybe relatability is the theme or what attracts me to those projects that are very dissimilar. You look at these dismal numbers of female directors and female producers. I’ve been doing it literally 30 years now, and it hasn’t really changed very much. I wish that it had changed more. I mean, it’s certainly taken small steps forward, but it’s not hugely different. It is very difficult. It’s harder as a woman. I went to film school at USC, so I always had a mentee every year from there. A girl. And then I always have a mentee every year from the Producer’s Guild, which is another group that I’m affiliated with. And then I was on the board of a girl’s school here called the Archer School for girls for six years. So I work with those girls also. I love spending time around young people, because they have so much more energy than I do. I’m old and tired, and you spend time around like your mentee and a young person and you get so much inspiration from them. I do really appreciate the mentor thing. I always share with them mistakes that I made, more so than wisdom, because sometimes you can learn more from other people’s mistakes. Alice has so many wonderful scenes, but do you have one that you like the most? There’s sort of a running joke from the two movies because I work sometimes with my younger sister who happens to have red hair. 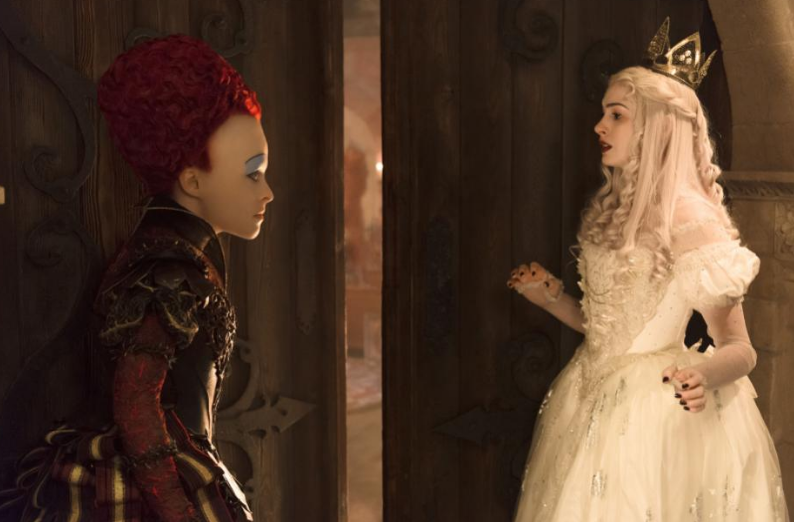 So in the first movie, there was always this sort of Red Queen, White Queen joke that the White Queen is the good one and Red Queen is the bad one. Although you may have thought that in the first movie, certainly in the second movie, you get to see it differently. There is something about that sister story line, you know, because I have two sisters so that’s very special for me. When you look at the young White Queen, the idea that she’s not bad person. I think all of us, have behaved that way. I behaved that way when I was a kid. You know, when you just make a mistake. She just did the wrong thing and in the moment, you feel like you’re on the spot and she said the wrong thing. And then when you see in the movie the trajectory of everything that happened because of that. I love that scene at the end where they have a little tiny bit of reconciliation, although we’ll see how long that lasts, if we make another movie. . .
Did you catch that very last line of the interview? I’m hanging on her every word… and hoping (hoping!!) 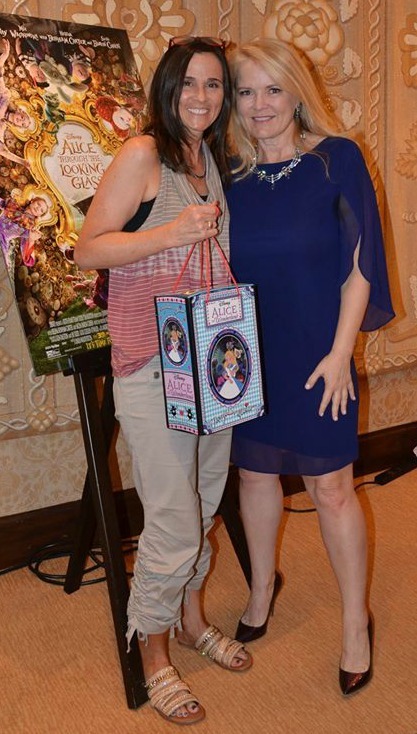 that we see another Alice film produced by Suzanne Todd. I adore this woman and I just can’t tell you enough how much this interview meant to me and how this experience strengthened my belief in women supporting and encouraging other women. Thank you Suzanne for an amazing movie, interview and meeting. Most of all, thank you for your muchness. Inspirational to women and young girls everywhere! 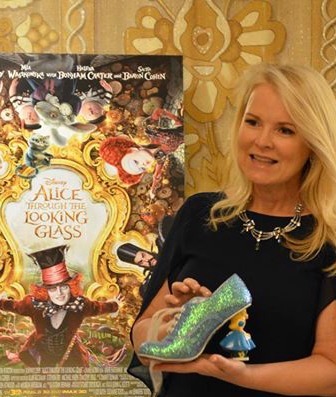 And as I said earlier, I did wear my new sparkly Alice shoes to the red carpet premiere. You can read more about my red carpet experience here. More about Move for Minds and the Women’s Alzheimer’s Challenge. If you too are passionate about helping to find a cure for Alzheimer’s, or even if you are just looking to find out more, please check out Maria Shriver’s blog where she talks openly and fights fiercely for more research, education and funding for Alzheimer’s. I love that, as women, we can not only support and uplift each other, but we can support and uplift future generations of strong and capable women. Here is my daughter holding the blue shoes… of which she is totally enamored. 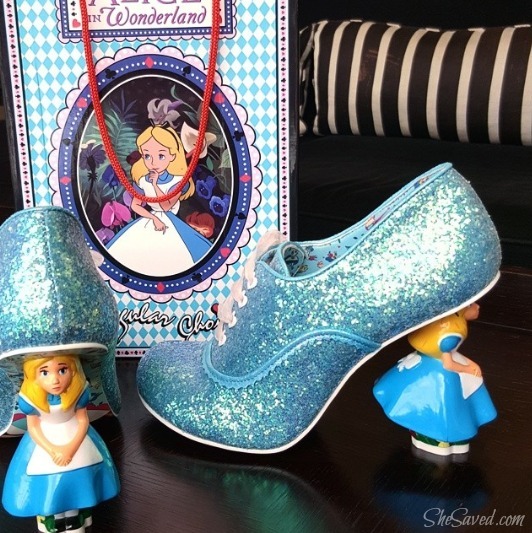 These shoes already have a place of honor in our Disney cabinet, and I love that these shoes will come to mean so much more to here than just a pair of pretty shoes. They certainly mean so much more than that to me.